Inspired creator, Pierre Hermé adopted an original approach that has revolutionized the traditions of the craft: banishing excessive decorations, using sugar like salt - as a seasoning to bring out other subtle flavors, reinventing himself every day, exploring new flavors, introducing new ingredients and revisiting his own recipes. 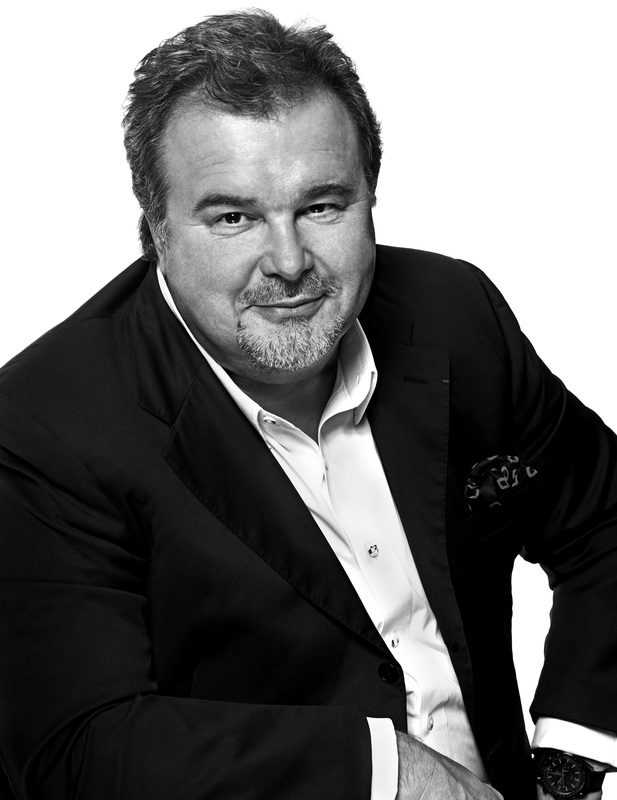 Ensconced in his Creative Studio, like an artist, Pierre Hermé imagines his tastes and flavor combinations. He actually draws his creations, just like a couturier does. He writes the recipes, sets the proportions. At his side, the pastry chefs carry out trials until they achieve the result he created in his mind. From small pleasures to encounters, from reading to travelling, fragrances to textures... Pierre Hermé is curious about everything. Everything is a source of inspiration to him. His work and his audacity have made him a pillar in French gastronomy. All around the globe, the pastry chef and chocolatier who was awarded the title of World’s Best Pastry Chef in 2016 by the World’s 50 Best Restaurants and as the 4th most influential French person in the World by Vanity Fair the same year, has put his technical expertise, talent and creativity at the service of every gourmet’s pleasure. Sift the flour and starch together and set aside. Cook the yolk in a bowl in the microwave for 30 sec, and grate it thru a sifter with a metal mesh. Cream the butter with the sugar, salt, yolk, and the flour and starch. Do not over knead the dough. Spread the dough roughly, and wrap it and refrigerate for 1h. Spread the dough on a 4mm thickness, and cut out an 18cm circle with a cake ring. Set the dough circle on a lined sheet pan, and refrigerate for 1h. Bake at 165ºC for 16mn. Set aside for finishing. Put to a boil the flour and the butter. Add in the flour previously sifted. Cook at 80C. The dough should have a soft and shiny texture. Pour the dough in a Kitchenaid, and add in gradually the eggs and the yolks without stopping mixing. Separately, beat the egg whites with the sugar, till firm. Fold in the white mixture into the first one. Pour the mixture on a 30x40 cm rectangular cake frame. Bake at 160ºC for 18mn. Cut out a disc of 18cm and reserve in refrigerator till finishing. The day before: peel and slice the apples and quinces (3-4mm thick). Set in a pan a layer of sliced apples and spread over it some melted butter with a brush. Add on top, a layer of sliced quinces, and spread as well some melted butter with the brush. Sprinkle on top the Rose syrup. Cover with a plastic wrap and bake at 90ºC for 10h. Leave at room temperature for 6h. Drain the mix in a sieve and reserve in the refrigerator. The same day: Mix the gelatin in cold water. Reheat the Steamed Apple and Quinces at 100ºC for 30mn, and fold in the melted gelatin mass. The day before: Soak the gelatin in cold water for 20 mn. Mix the yolks with sugar. Put to a boil the cream, and add in the yolks mixture. Cook at 85ºC. Add I n the gelatin, Rose, syrup and rose extract. Mix the mixture with a hand mixer. Refrigerate for 12h. Cream the mascarpone cheese and add the Rose Cream Anglaise. For a 20 cm Round Cake ring: Pipe along the inside perimeter of the cake ring some Rose Mascarpone Cream, and put in the Breton Shortbread Disc at the bottom. Spread another layer of Rose Mascarpone Cream, and spread that the cream cover the inside edge of the ring, but not necessarily on the inside. Insert the Soufflé Biscuit with the Rose Apple and Quince Etuve disc. Cover with the Rose Mascarpone Cream till the top of the ring. Blast Freeze till finishing. With a Vegetable Band Cutter, cut 6 cm wide Apple bands (Leave the apple unpeeled). Roll the apple bands over the unmolded Entremets. 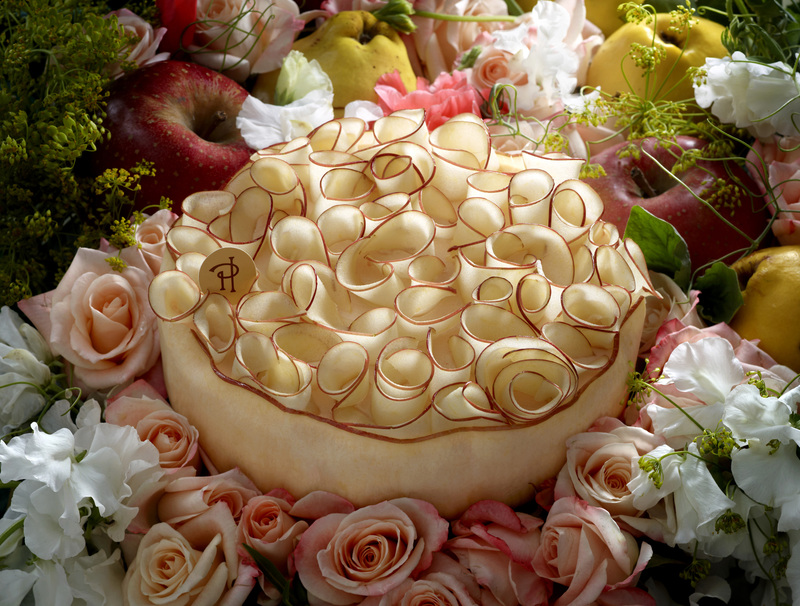 Cover the entremets with very thin sliced apples rolled or curved (Apples will be sliced with a mandolin set up on the thinner position). Spray the entremet with the Exotic glaze.